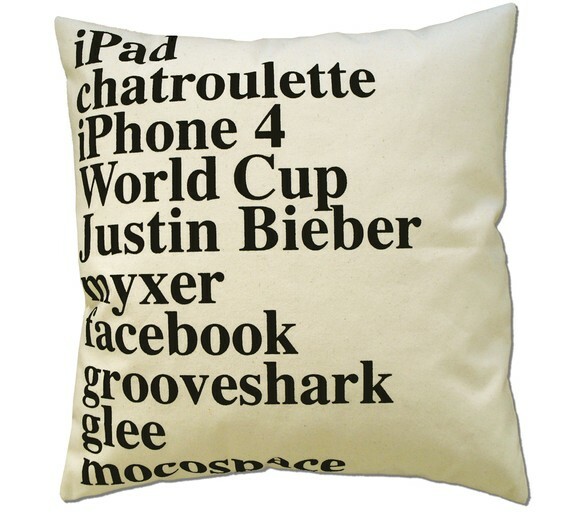 Ever since I spotted this Google pillow in Paula Scher's home, I've wondered what each year's most top searched topics will be. Fascinating, huh, and if you want it all on a pillow you can find it here. Oh and did you realize today is 1/11/11!! A-wesome. Make a wish. Haha! Justin Beiber!? This pillow is definitely a conversation starter. Um, that is so awesome. That is so cool! I kind of want to buy one for each passing year. Mostly because it'll be a funny reminder later of what used to be popular. I second the idea of collecting one each year. Totally fun. This is amazing. I know what I want to start collecting. so. cool. i love it! !